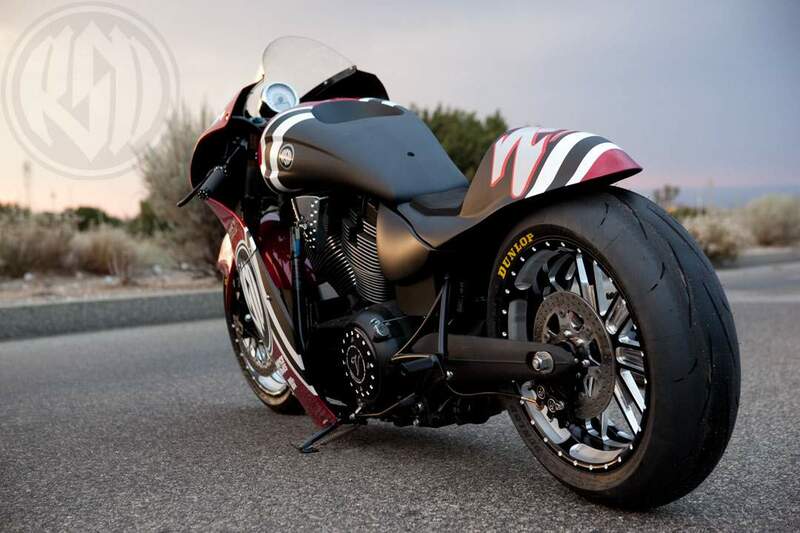 Despite the fact that a Victory Hammer cruiser fitted with a 1700cc, 100bhp V-twin, could seem improbable to be used as the base of a custom build that puts out 200 horsepower and hits a top speed of 200 mph (320 km/h), the guys at Roland Sands Design have done it. As a result, we have a V-twin cruiser that’s as powerful and fast as a Hayabusa or a ZZR1400. “If you’re addicted to speed like we are there’s a number in your head that you would like to get to. That number for us is 200,” RSD says. Dubbed Mission 200, the project started with a host of modifications in terms of aerodynamics and ergonomics, and continued with the improvements made to the engine by the team at Lloydz Motor Works. stainless steel valves and bolted on a Garrett turbocharger. In addition to that, they have also converted the bike from belt- to chain-drive. “This build was our most demanding yet most rewarding as well. We totaled over 320 hours to this build and just about all the components used are one off items do to the nature of the build and the fact that it was an 2011 bike for which some parts have been changed since 2010,” Lloydz Motor Works (LMW) said. “Once the bike was running we found that a new style rings we used was causing oil to pull through the ring package under decel so we had to do another tear down and repair the issue in less then a day. Back running it only took us 2 days to tune the bike with only 1 minor issue that occurred. With a build of this caliber I was counting on 2 weeks of tuning so when we were able to wrap it up so soon we were all extremely happy,” LMW continued.